Stephen Girard (May 20, 1750 – December 26, 1831; born Étienne Girard) was a French-born, naturalized American, philanthropist and banker. He personally saved the U.S. government from financial collapse during the War of 1812, and became one of the wealthiest people in America, estimated to have been the fourth richest American of all time, based on the ratio of his fortune to contemporary GDP. Childless, he devoted much of his fortune to philanthropy, particularly the education and welfare of orphans. His legacy is still felt in his adopted home of Philadelphia. Girard was born in Bordeaux, France. He lost the sight of his right eye at the age of eight and had little education. His father was a sea captain, and the son cruised to the Caribbean and back, was licensed as a captain in 1773, visited California in 1774, and thence with the assistance of a New York merchant began to trade to and from New Orleans and Port au Prince. In May 1776, he was driven into the port of Philadelphia by a British fleet and settled there as a merchant. In 1776 Girard met Mary Lum, a Philadelphia native nine years his junior. They married soon afterwards, and Girard purchased a home at 211 Mill Street in Mount Holly Township, New Jersey. She was the daughter of John Lum, a shipbuilder who died three months before the marriage. In 1778 Girard became a resident of Pennsylvania. By 1785 Mary had begun succumbing to sudden, erratic emotional outbursts. Mental instability and violent rages ensued, leading to a diagnosis of incurable mental instability. Though Girard was initially devastated, by 1787 he took a mistress, Sally Bickham. In August 1790 Girard committed his wife to the Pennsylvania Hospital (today part of the University of Pennsylvania) as an incurable lunatic. He provided her every luxury for comfort, she gave birth to a girl whose sire is not entirely certain. The child, baptized with the name Mary, died a few months later while under the care of Mrs. John Hatcher, who had been hired by Girard as a nurse. Girard spent the remainder of his life with mistresses. In 1793, there was an outbreak of yellow fever in Philadelphia. Although many other well-to-do citizens chose to leave the city, Girard stayed to care for the sick and dying. He supervised the conversion of a mansion outside the city limits into a hospital and recruited volunteers to nurse victims, and personally cared for patients. For his efforts, Girard was feted as a hero after the outbreak subsided. Again during the yellow fever epidemic of 1797-1798 he took the lead in relieving the poor and caring for the sick. After the charter for the First Bank of the United States expired in 1811, Girard purchased most of its stock as well as the building and its furnishings on South Third Street in Philadelphia and opened his own bank, variously known as "Girard’s Bank," or as "Girard Bank." or also as "Stephen Girard’s Bank" or even the "Bank of Stephen Girard." Girard was the sole proprietor of his bank, and thus avoided the Pennsylvania state law which prohibited an unincorporated association of persons from establishing a bank, and required a charter from the legislature for a banking corporation. Girard hired George Simpson, the cashier of the First Bank, as cashier of the new bank, and with seven other employees, opened for business on May 18, 1812. He allowed the Trustees of the First Bank of the United States to use some offices and space in the vaults to continue the process of winding down the affairs of the closed bank at a very nominal rent. Girard's Bank was a principal source of government credit during the War of 1812. Towards the end of the war, when the financial credit of the U.S. government was at its lowest, Girard placed nearly all of his resources at the disposal of the government and underwrote up to 95 percent of the war loan issue, which enabled the United States to carry on the war. After the war, he became a large stockholder in and one of the directors of the Second Bank of the United States. Girard's bank became the Girard Trust Company, and later Girard Bank. It merged with Mellon Bank in 1983, and was largely sold to Citizens Bank two decades later. Its monumental headquarters building still stands at Broad and Chestnut Streets in Philadelphia. On December 22, 1830, Stephen Girard was seriously injured while crossing the street near Second and Market Streets in Philadelphia. He was knocked down by a horse and wagon, and one of its wheels ran over the left side of his face, lacerating his cheek and ear, as well as damaging his good (left) eye. Despite his age (81), he got up unassisted and returned to his nearby home, where a doctor dressed his wound. He threw himself back into his banking business, although he remained out of sight for two months. Nevertheless, he never fully recovered and he died on December 26, 1831, coincidentally the Feast of St. Etienne--St. Stephen's Day in the Western Church. He was buried in the vault he built for his nephew in the Holy Trinity Catholic cemetery, then at Sixth and Spruce Streets. Twenty years later, his remains were re-interred in the Founder's Hall vestibule at Girard College behind a statue by Nicholas Gevelot, a French sculptor living in Philadelphia. 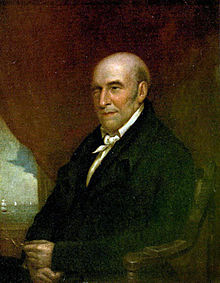 At the time of his death, Girard was the wealthiest man in America and he bequeathed nearly his entire fortune to charitable and municipal institutions of Philadelphia and New Orleans, including an endowment for establishing a boarding school for "poor, male, white orphans" in Philadelphia, primarily those who were the children of coal miners, which opened as the Girard College in 1848. Girard's will was contested by his family in France but was upheld by the U.S. Supreme Court in a landmark case, Vidal et al. vs Girard's Executors, 43 U.S. 127 (1844). Michael Klepper and Robert Gunther, in their book The Wealthy 100, posit that, with adjustment for inflation, Girard was the fourth-wealthiest American of all time, behind John D. Rockefeller, Cornelius Vanderbilt and John Jacob Astor. He was an atheist all the way up to his death, and he included his views on religion in his last testament. Girard Avenue, a major east-west thoroughfare of North Philadelphia and West Philadelphia and the location of Girard College, is named for him, as is the neighborhood of Girard Estate and the borough of Girardville, Schuylkill County, located roughly 110 miles northwest of Philadelphia, which is bordered by many acres of land still connected to the Girard Estate. Stephen Girard Avenue, located in the Gentilly area of New Orleans, is named for Stephen Girard. In 1832 Girard, Pennsylvania in Erie County, Pennsylvania located roughly 450 miles northwest of Philadelphia was named for him. In 1821, Girard financed and oversaw the startup of a plantation managed by his friend and agent, Henry Bry. The community of Girard, Louisiana, in Richland Parish where it was located is also named for him. North America a bargue built by Stephen Girard (circa 1816). Stephen Simpson (writer), former employee at Girard's bank and author of book Biography of Stephen Girard, with His Will Affixed (1832), very critical of Girard. ^ In Fortune Magazine: "richest Americans: Archived 2009-09-19 at the Wayback Machine, with an estimated wealth at death of $7,500,000 Girard's Wealth/GDP ratio equalled 1/150. Chisholm, Hugh, ed. (1911). "Girard, Stephen" . Encyclopædia Britannica (11th ed.). Cambridge University Press. ^ a b DiMeo, Mike. "Stephen Girard". www.ushistory.org. Independence Hall Association. Retrieved 2016-08-14. ^ Wilson, George (1995). Stephen Girard. Conshohocken: Combined Books. pp. 121–133. ISBN 0-938289-56-X. ^ a b "Girard's Bank". LOC Authorities. Library of Congress. Retrieved 2009-05-02. ^ Konkle, Burton Alva (1937). Thomas Willing and the First American Financial System. Philadelphia, PA: University of Pennsylvania Press. pp. 199–200. ^ Wilson, George (1995). Stephen Girard. Conshohocken: Combined Books. pp. 249–250. ISBN 0-938289-56-X. ^ Wilson, George (1995). Stephen Girard. Conshohocken: Combined Books. p. 249. ISBN 0-938289-56-X. ^ Wilson, George (1995). Stephen Girard. Conshohocken: Combined Books. pp. 329–333. ISBN 0-938289-56-X. ^ Klem, Monica. "Stephen Girard | The Philanthropy Hall of Fame | The Philanthropy Roundtable". Philanthropy Roundtable. Retrieved 2016-08-14. ^ DiFilippo, Thomas J. "The Will, No Longer Sacred". Stephen Girard, The Man, His College and Estate. Joe Ross. Retrieved 2016-08-14. ^ "Vidal v. Girard's Executors". Justia. U.S. Supreme Court. Retrieved 2016-08-14. ^ Gray, Carole (Spring 1999). "The Atheist Who Saved The United States (...and the thanks he got for it)". The American Atheist. 37 (2): 34–44. Archived from the original on 2008-06-04. One of his longtime employees, whose father had also worked for Stephen, said of him, "on the subject of religion, his opinions were atheistic. Let not the reader start, to find himself in company with one, who utterly disbelieved in all modes of a future existence, and who rejected with inward contempt every formulary of religion, as idle, vain, and unmeaning. Yet such were the convictions of Girard, held to his dying hour, and perpetuated in his last testament as a legacy to future generations .... He was known to be totally irreligious; and to attempt to conceal what is notorious, would be to suppress one of the most extraordinary features of his character." ^ "25 Apr 1954, Page 26 - Monroe Morning World at Newspapers.com". Newspapers.com. Retrieved 2018-08-18. Wildes, Harry E. Lonely Midas: The Story of Stephen Girard (1943). Wikimedia Commons has media related to Stephen Girard. Wikisource has the text of an 1879 American Cyclopædia article about Stephen Girard.